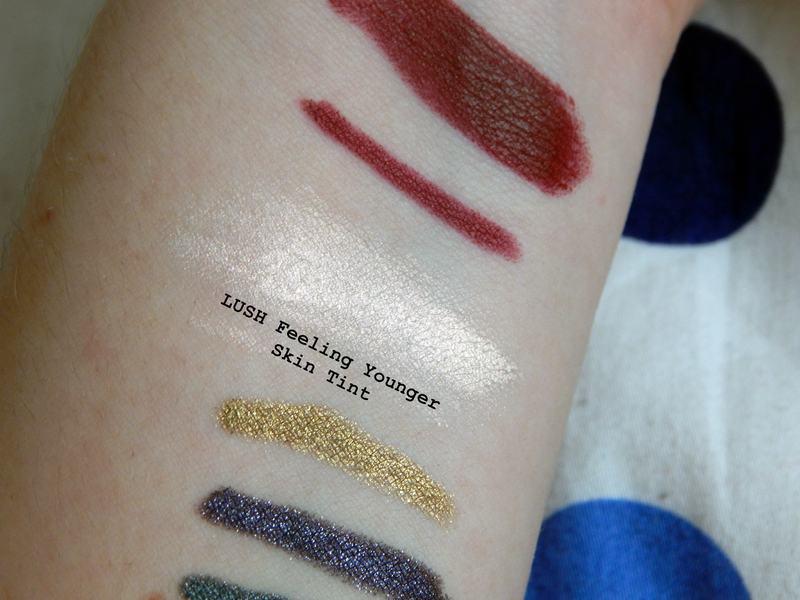 The way I understand it, the Feeling Younger Skin Tint by LUSH is meant to be mixed with a moisturiser or a foundation for giving your skin extra oomph- I must admit I've never tried it, because this stuff is very shimmery/borderline metallic! It works brilliant as a cream highlighter for the inner corners of the eyes- my favourite way of using it right now- or a really noticeable highlight on your cheekbones. Either way, you get 20ml in one tub, and you only need the tiniest amount when using it, so this will practically last you forever! Here's my arm at an awkward angle so you can see the shimmer/sheen! Isn't it gorgeous? 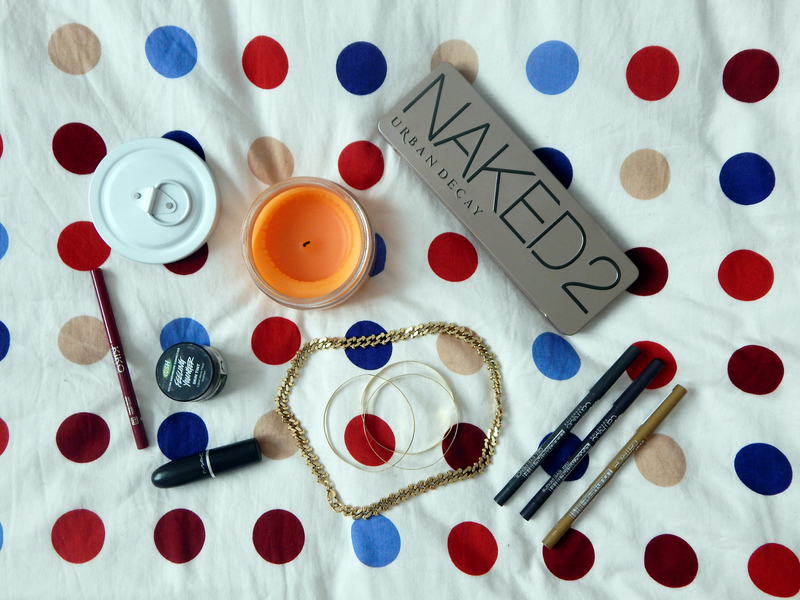 Since it's officially Autumn, dark lips are officially in season again! (Not that you can't wear them all year around and be fierce and fabulous- I'm all for that!) 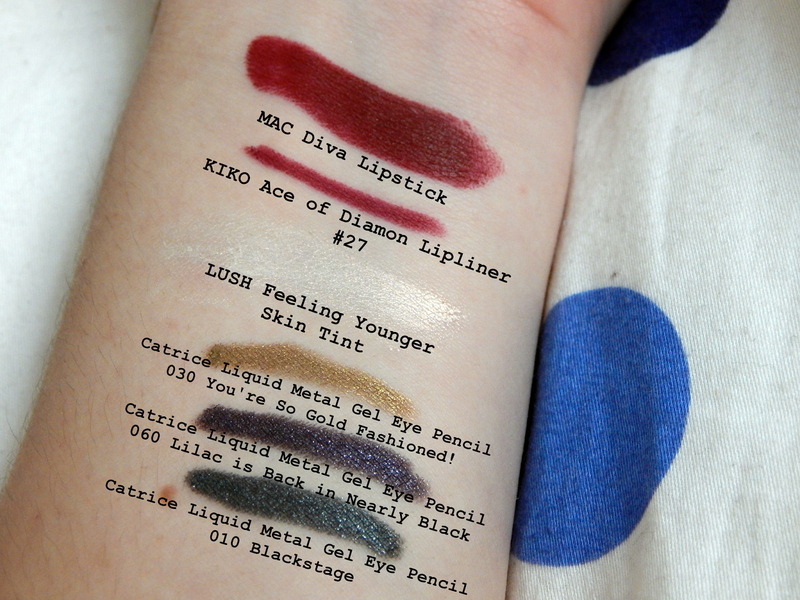 One of my favourite combinations this past month was layering the KIKO Ace of Diamond Lip Liner in 27 (which is part of their Daring Game collection that is out now) underneath MAC Diva Lipstick. Both are super-matte, and together, their a long-lasting dream team! I'm generally so pleased with the formula of the lip liner, it just glides on the lips and is both completely matte and creamy at the same time- well done, KIKO! MAC Diva is a favourite of many people I'm sure- the perfect dark red lipstick for the colder seasons! If you read my blog regularly, you would have witnessed my excitement when I won a giveaway by Catrice Cosmetics earlier this past month! Part of my win were the Liquid Metal Gel Eye Pencils in 030 You're So Gold Fashioned! and 060 Lilac is Back in Nearly Black- two eyeliners that have a wonderfully smooth formula that's absolutely long-lasting- I was seriously so impressed with these, I just had to get another one, and I opted for the shimmery black version 010 Blackstage. For now, I have ditched the regular black liquid liner and only use these if I'm feeling eyeliner- they're so easy to apply as well, just an overall great product. Should you ever wonder why my swatches look so wonky- I'm left-handed and I can't draw straight lines with my right hand for the life of me, but I have to since I have to handle my camera with my right hand. 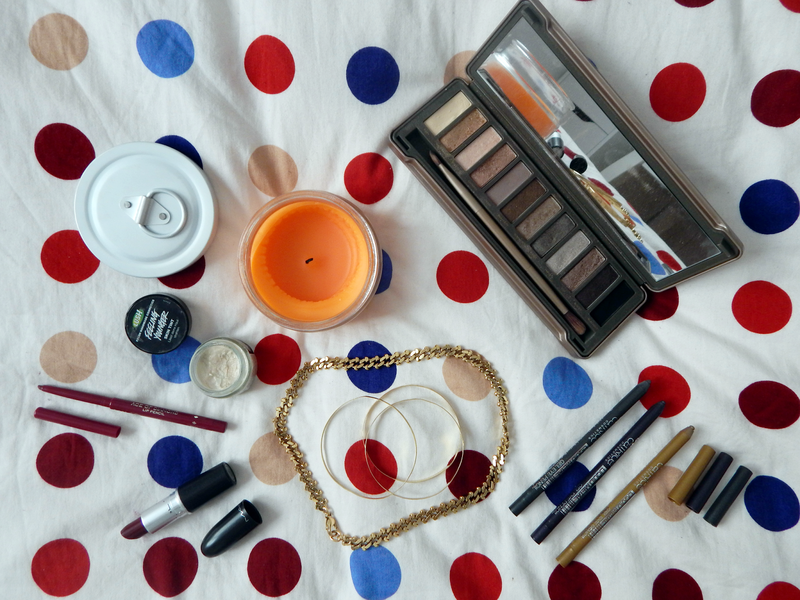 To finish, I also have a few non-beauty items as well. 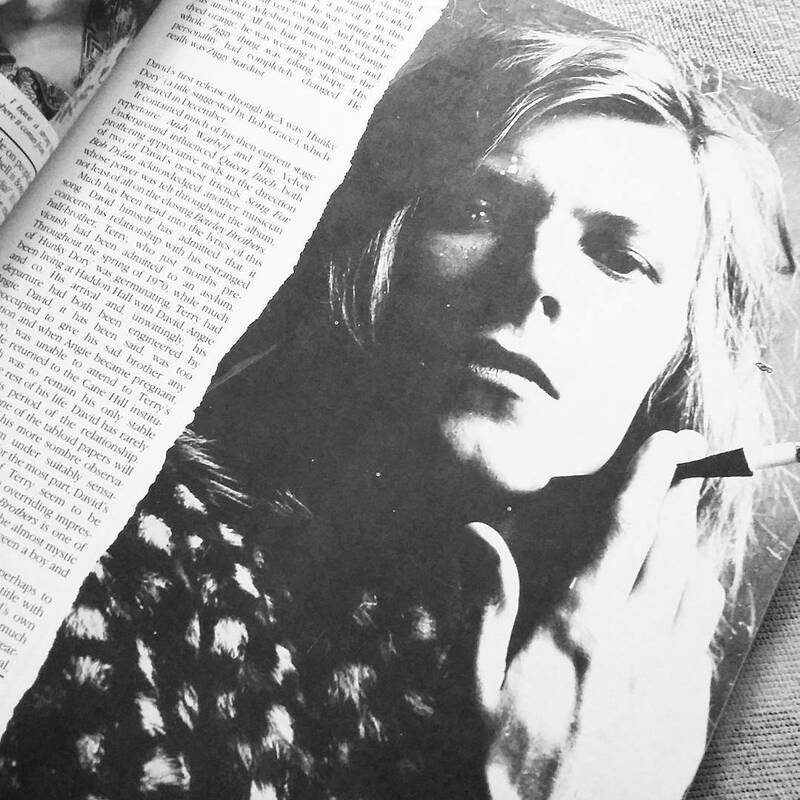 As you can see on the pictures above, there's also a candle thrown into the mix. Now, I love candles, but I'm a poor poor student who just quite her retail job yesterday, so I'm definitely now buying the likes of Diptyque and Jo Malone anytime soon. For now, I'm sticking with good old IKEA- this candle has the brilliant name Flärdfull and costs 2,99€. It smells like peaches, it burns for about 25 hours, and it comes with a handy lid so you don't have to blow out your candle and smoke up the whole room while you do so. What's not to like? Finally, a few recent jewellery items added to my collection: The chain necklace you can see on the picture above was a gift from my mom- we went through some of her older jewellery on the weekend and since she saw me wear a similar chain necklace that was already losing it's gold colour (because it's cheap and from H&M), she gave me a similar one that is way better quality and won't fade in colour anytime soon! Thanks mum! 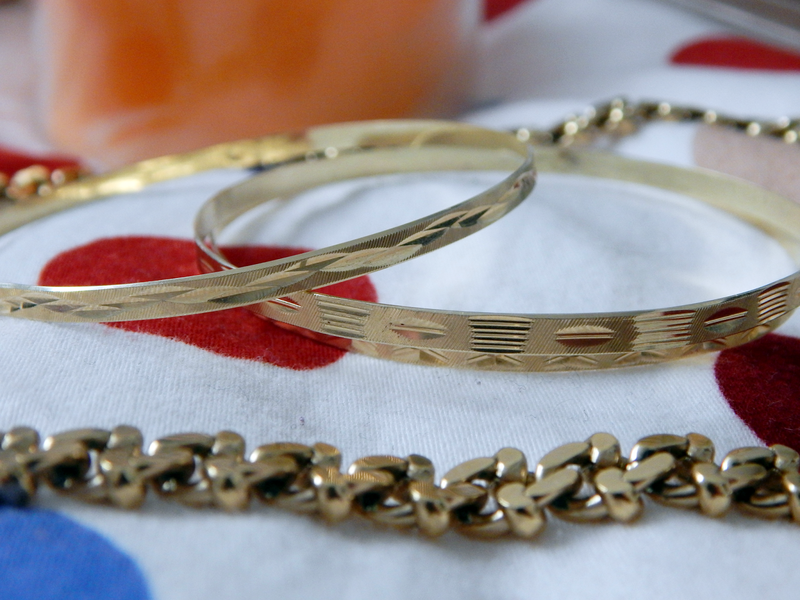 Similarly, I've inherited three beautiful gold bangles (yes, actual gold!) from my grandmother (don't worry, she's still fine, she just loves me) on my last visit. I love them, they're very dainty and light and pretty, and all of three of them have a different little pattern going around them. Again: Thanks grandma!